Think of the worst weather conditions you can imagine – rain, sleet, salt spray. 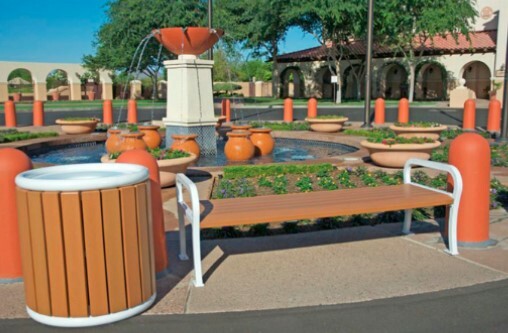 That’s exactly what we’ve designed our extensive line of Wabash outdoor furniture and site amenities to withstand, thanks to their tough PLASTISOL coating. These coated pieces consist of ¼” PLASTISOL coating, heat-fused and permanently bonded to the steel – that’s 30 times the thickness of paints and powder coatings. All Wabash framework is coated with baked-on polyester dry powder, which provides a superior coating and appearance. Since its beginning, Wabash Valley continues to be the leader in the PLASTISOL coated site amenity and furniture industry. We strive to offer the widest selection, highest quality and best prices in the market. 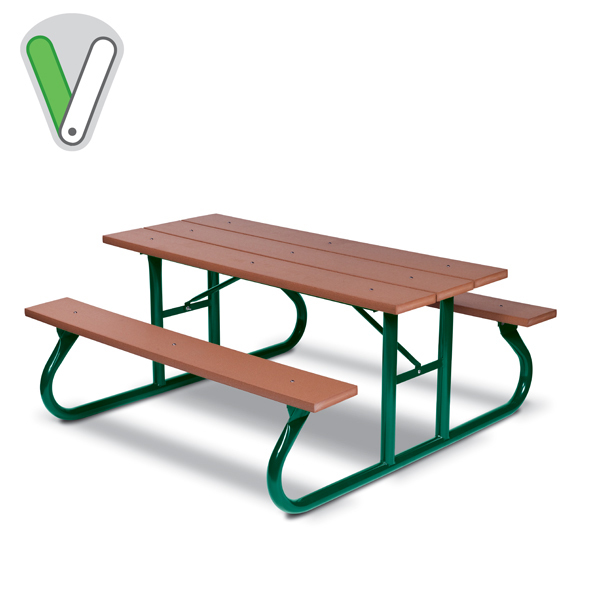 We offer a wide range of picnic tables. Many are available in 6', 8' and 10' lengths. 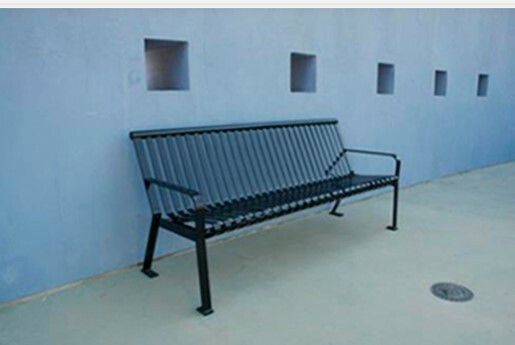 To meet the needs of the disabled, ADA accessible designs are offered. 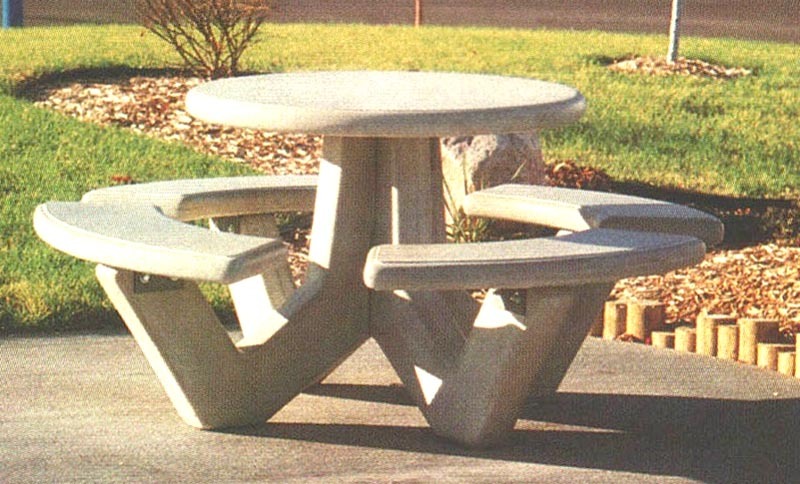 Signature Picnic Table … our most popular. 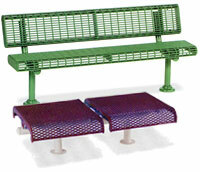 The Signature Series are perfect for picnic areas, schools, parks or any heavy traffic settings. Tables are constructed from 3/4" #9 expanded steel mesh. With its durable construction, you can never go wrong with this heavy-duty, all-purpose furniture. 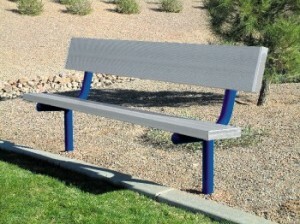 We offer a wide range of benches. 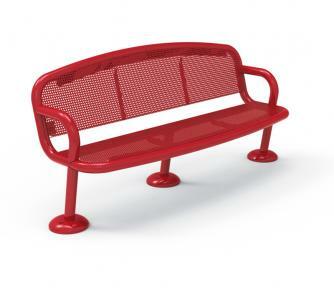 Choose from plastisol-coated steel, wood, fiberglass, recycled plastic and aluminum. Many are available in 2', 4', 6', 8', 10', 15' lengths, offering the flexibility to fit your area. 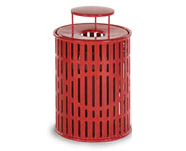 When it comes to litter receptacle choices, We offer a large variety. The sizes range from a 10-gallon pole mount receptacle to a 55-gallon free-standing receptacle, and there are various sizes in between. Our insert receptacles, shown to the right. We offer this receptacle in our diamond, welded wire or rib patterns. This is a 32-gallon receptacle that comes standard with a liner and adjustable glides. The glides are perfect for indoor applications, keeping the receptacle off of the floor, and to prevent scratching. To complement the receptacle, we offer a dome top or one of our three flat top lids. Our inground or surface mount post packages can be used with these receptacles (lids and leg mounts are sold separately). 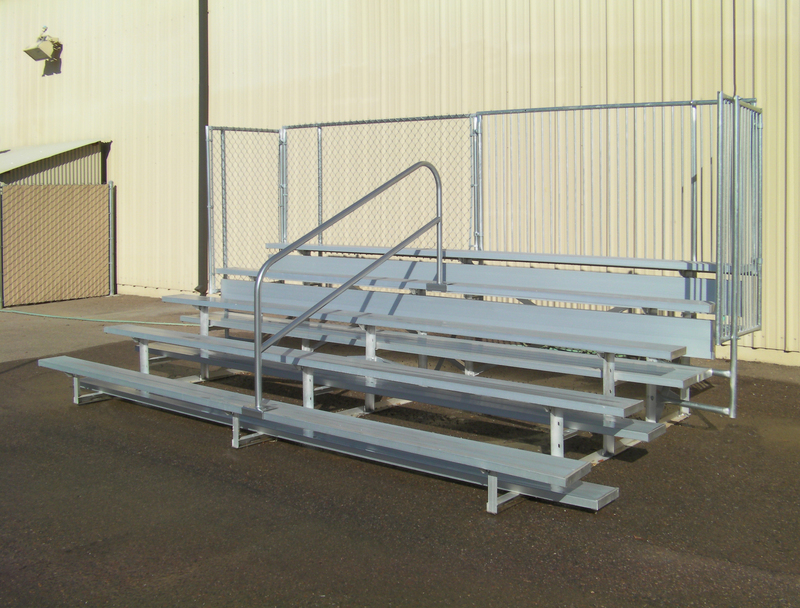 Choose from plastisol-coated steel, wood, fiberglass, or recycled plastic. Our tree grates are wonderful for your landscaping needs. Like our most popular furniture, they are coated in a tough PLASTISOL coating and are backed by our five-year limited warranty. The PLASTISOL coating used on our Tree Grates is specially formulated to give them a slip-resistant surface. They are guaranteed not to crack, peel, warp or rot, and are unaffected by common acids, alkalis, salts, acid rain, sewage or sea water. 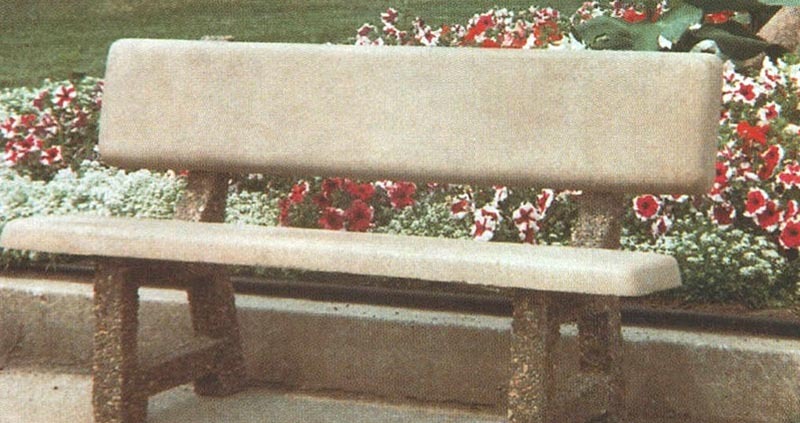 With the PLASTISOL coating they are virtually maintenance-free, never need painting and will not leaf stain. Unlike cast iron tree grates, these are substantially lighter, saving on installation and freight costs. All of our tree grates are in compliance with the Americans with Disabilities Act of 1990. 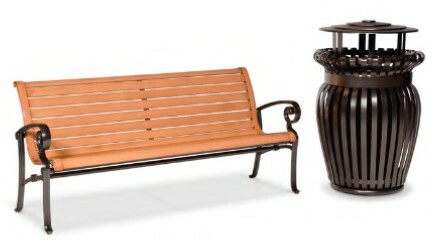 Choose from two great designs, our standard Universal design or our Santa Fe design. Either will add beauty to your landscape (special designs are available). Tree Grates are limited to black, green and burgundy colors. To complement our Tree Grates, we offer framing and tree guards. 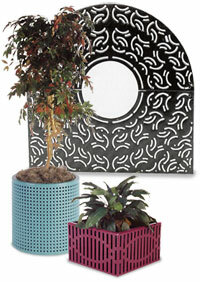 To complement our line of site amenities, we offer a wide range of sizes and shapes of our planters. They are available in both the diamond and welded wire pattern. They come in both round and square styles, and a small as 24" x 18" to as large as 48" x 30". They are sold standard with a black molded plastic liner (white is available upon request). To add to our long list of accessories,we offer our ash urn and our ash/trash unit. The ash urns are available in both our diamond pattern and our welded wire pattern. 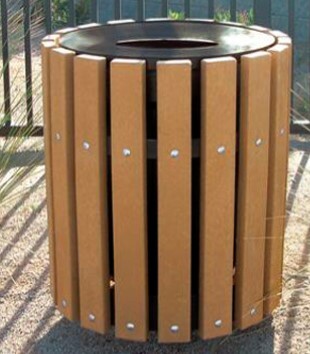 Our ash/trash unit is only available in our diamon pattern. Both units come standard with a black tray. The ash/trash unit has a 4 3/4"" diameter hole for the trash, which is collected in a 13 1/4" x 8" dia. galvanized container. An inground post package can be used with both units. 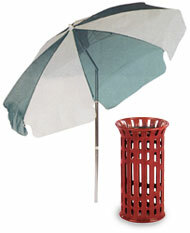 Wabash Valley offers two styles of umbrellas. Our standard umbrellas, which are available in 7 1/2' or 8 1/2' sizes, and our market umbrellas which are only available in a 9' size. Our standard umbrellas are constructed from an aluminum frame, and are opened and closed through a crank system. The standard umbrellas can be ordered with any of the textilene fabrics or our polyester fabrics. Our market umbrellas are only available in the olefin fabrics. Urbanscape gives you the best of both worlds … our commitment to distinctive design and an unparalleled aesthetic appeal. This is furniture unlike anything seen before, backed by the manufacturing quality and excellence you have always known from Wabash Valley. Although Urbanscape gives a high-end look, it is not high-priced. This line can fit any budget as well as it fits into virtually any landscape. You achieve a head-turning look without eye-popping costs — one more way Urbanscape is the smarter choice you can make. Urbanscape has a realistic Faux-wood finish that is yet another way you get the best of both worlds. Beneath the surface is the strength, durability and reliability of a Powder-coated aluminum structure. With the Faux-wood finish, you get the look and beauty of real wood … all the benefits without any of the headaches of real wood such as breakage, warping or rot. This is Faux-wood so good, you won’t visually see a difference from nature’s wood. It’s probably be true that we are all designers at heart. You seek the ideal look … perhaps that perfect touch with subtle curves that present great looks and impresses all who see it. That is why Urbanscape is not only engineered, but it’s architecturally designed. In developing this line, Wabash teamed up with two very talented and internationally renowned firms, Garofalo Architects headquartered in Chicago, and John Caldwell Design headquartered in California. D564,802; D570,065; D570,066; D571,581S; D572,048; D572,947; D572,047; D574,639. Green Valley offers an environmentally friendly alternative. 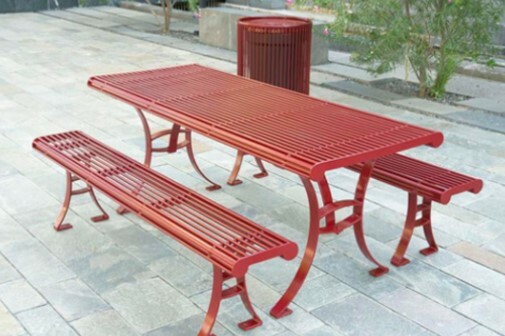 Constructed with Poly Tuf™ plastic lumber ( for seats and tops; framework is powder coated steel) custom-extruded from recycled plastics, Green Valley benches, tables and receptacles are long-lasting and nearly maintenance-free. They also don’t have the drawbacks of real wood, such as fading, insects, cracking and splintering. Unlike most wood and wood-composite products that quickly fade when exposed to the weather, the Poly Tuf™ surfaces have no wood fibers so they retain their vibrant look for years. In addition, they don’t need waterproofing, staining or any other maintenance other than an occasional washing with soap and water. Patterson-Williams Site Furnishings are designed and built to withstand beautifully to the elements and daily public use. Heavy Duty Steel, Stainless Steel Hardware, and tremendously durable Powder Coat Finishes ensure that Patterson-Williams products will be beautiful for years to come. All of our products represent an investment in quality … the best of the best. Handcrafted in the United States, Patterson-Williams furnishings are made by craftsmen who provide superior quality workmanship, producing outstanding products utilizing the highest quality materials. As you do, we believe placing American-made products in America’s public spaces strengthens our country and its economy. Let Us Help You Furnish Your Playground For more than 40 years, Playworld has helped selective communities furnish their schools, parks, businesses and organizations. Contact Playworld, and let us show you how our high quality playground furnishings will complete your play space with comfortable style. When you invest resources in a playground, including picnic tables and benches, they help your community get the most out of your play space. 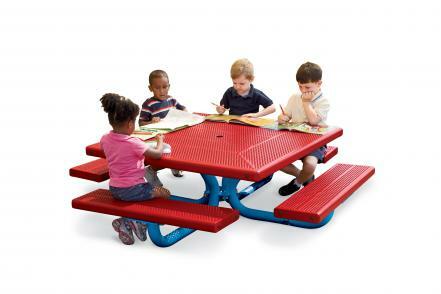 What better way to encourage friend-building activities than meeting at the playground for lunch or a snack — and because building communities is what Playworld is all about, our essential furnishings include picnic tables that are accessible by people of all ages and abilities. 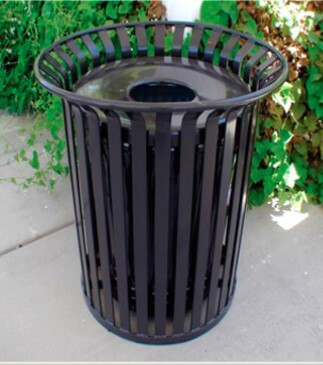 Of course, there’s nothing fun about garbage, and that is why we also make durable and easily cleanable litter receptacles. Best of all, because we believe the legacy of play should be safe and environmentally sound, we make our site furnishings from PVC-free and recyclable materials that will last for year after year. 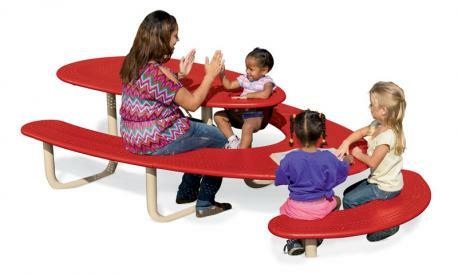 The only picnic table designed for the entire family: seating is scaled for adults and children, including a table top integrated high chair; wheelchair accessible; under-the-table hangers to hold coats, hats, bags & more! This Picnic Table is part of a new line of site furnishings, which connect families to one another and the environment. The organic, curved design enhances natural landscapes, creates graceful layouts in any space, and is inspired by the way families interact. Known throughout the sports equipment industry as the leader in material quality, workmanship, and warranty, PW Athletic Mfg. Co. has been supplying schools, municipalities, and park districts throughout the U.S. and Canada since 1919. We remain committed to purchasing materials made in the U.S. and continue to produce the most durable, long-lasting, customizable sports equipment being manufactured exclusively in America. As we celebrate our 9th decade of manufacturing, P.W. Athletic Mfg. Co. remains totally committed to our mission…providing safe, functional and high-performing products across the board. We are equally committed to providing an excellent customer service experience to each and every one of our customers. We guarantee service that is always reliable … always resourceful … and always responsive.